The exhibition “New Works” by Michael Bishop and Lynn Criswell, taking place at Kasa Gallery achieves just this, being right in the time of today and also being at a safe distance from it. 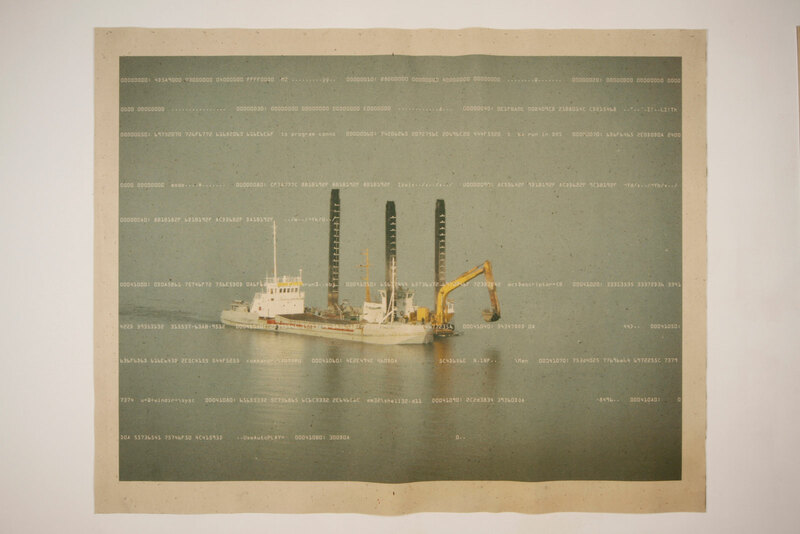 Michael Bishop takes photos of random mechanical objects, which he chooses to print on felt. This choice of material locates today in a different temporal setting, and the texts on the prints reach lands that are far away from the original territories. In her works, Lynn Criswell deals with and stands against mechanization, and the estrangement that mass production creates. 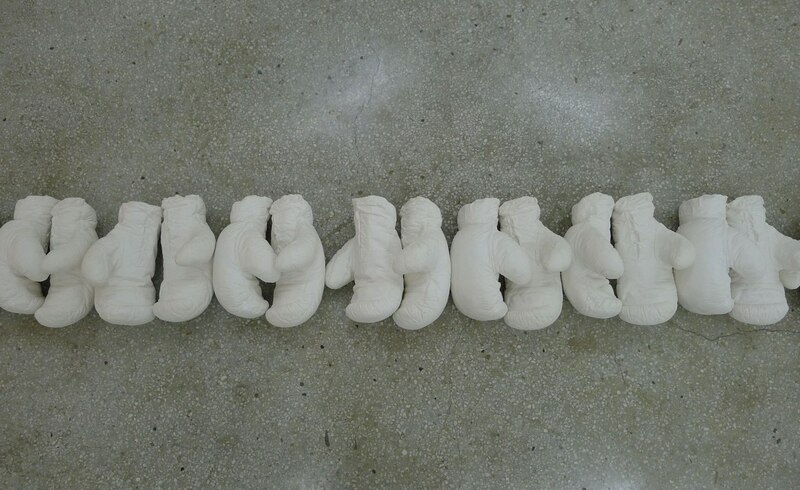 The artist takes apart the visual elements of eating, a most common daily ritual, and incorporates them into her own visual universe via unique strategies. 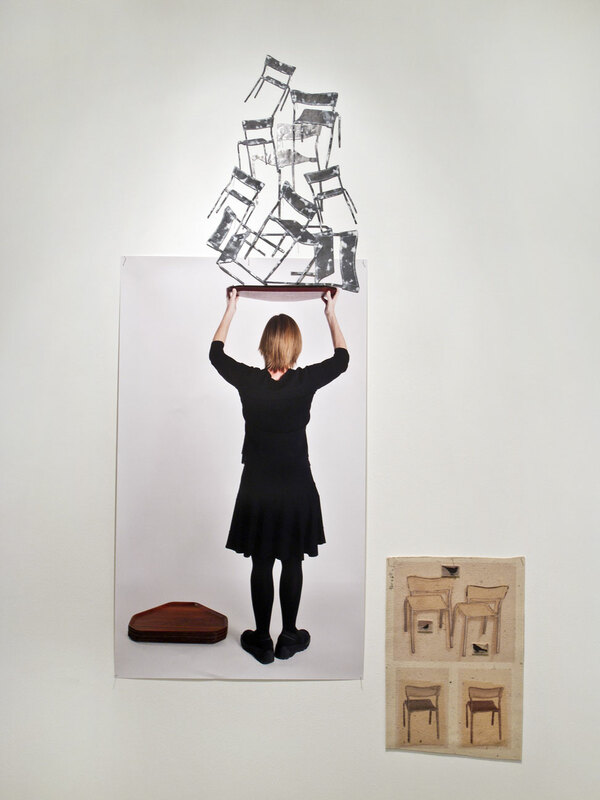 The exhibition is composed of works produced during the artists’ 2010–11 Visiting Scholars residency at Sabanci University. Descending the stairway to the vault of the Minerva Han, one of many historic bank buildings lining Bankalar Caddesi in Istanbul, the viewer must then enter through a heavy vault doorway, always ajar nowadays, to the KASA exhibition space. 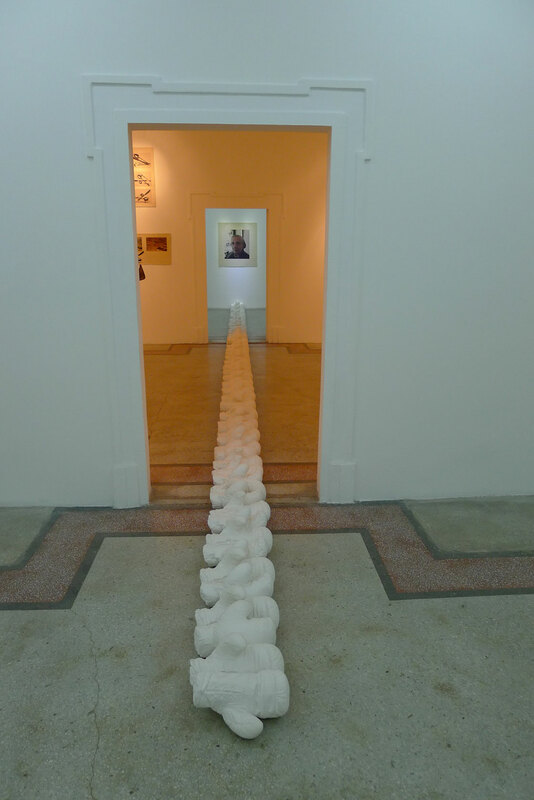 Once inside, the viewer is confronted with “Necile & Ali: The Calendar,” a line of 108 white plaster boxing gloves aligned on the floor, form the spine of three consecutive sections of exhibition space. At the end of the line of gloves, each looking like a hugging couple, a portrait of an indigenous looking woman catches the viewer’s eye. Other works of Michael Bishop are featured in the first section of the exhibition space accompanying the boxing gloves. Three large photos printed on industrial felt are hung on the three walls that make up this section. 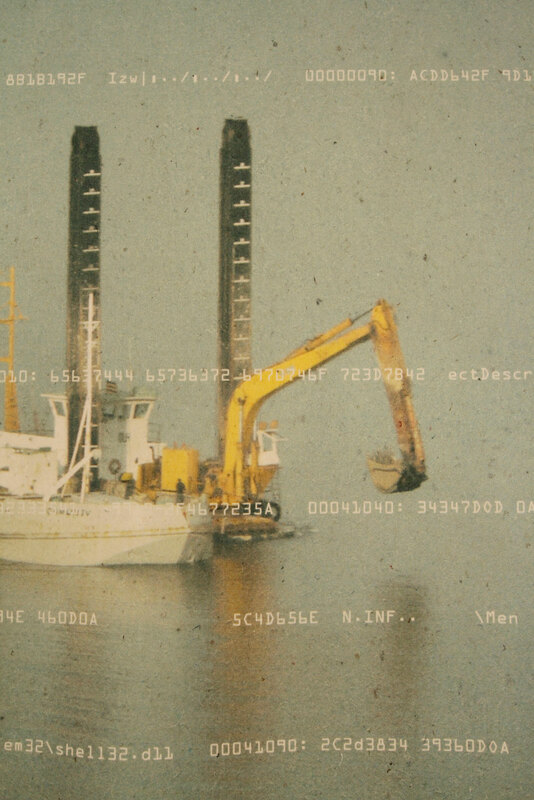 The first one “Hot Code, Stuxnet” is a photo taken from a hotel window where the artist stayed during a visit to Izmir. In the photo, there is a ship moored to a work platform equipped with a crane in the middle of the harbor. The ship, crane and iron pier scaffolding appear as one, while from afar, where the artist takes the photo, it appears as a dove struck by arrows or a sea monster. Over this image, as a foreground, a computer code appears in white letters. The code is a malware called Stuxnet purportedly implemented by the CIA and MOSAD to hack and collapse crucial computer components in the uranium enrichment infrastructure in Iran. 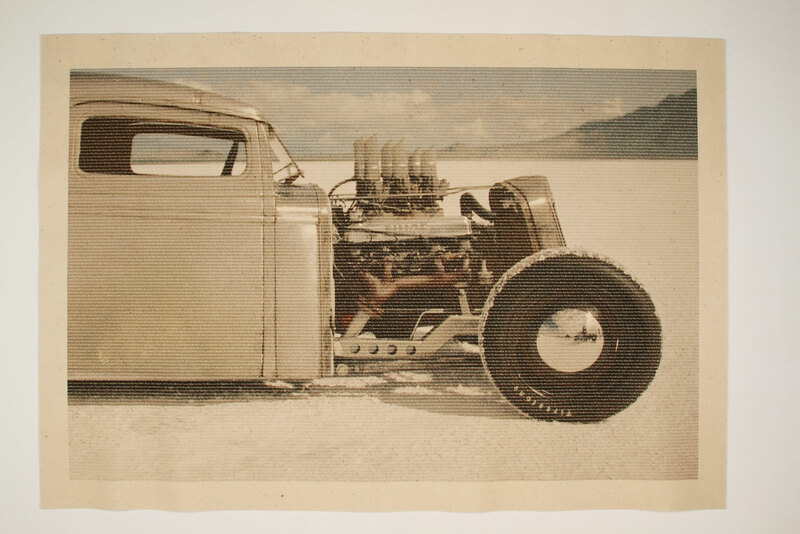 The other two photos in the first room, “Slammed English” and “Slammed Farsi” are duplicate images of a Hot Rod, modified cars that were highly popular as an “outlaw” image in the 1940’s and ‘50’s, in California . The exposed engine of the metallic car’s body is highly modified for illegal street racing and is dynamically close to the ground. For the ignorant eye, it might look like a car in repair, merely an antique without much meaning, however, for people who are familiar with a certain period in U.S. history (the movie American Graffiti is a popular view of this James Dean phenomenon) it has nostalgic significance. This car representing the local and personal is photographed against the white background of the vast Great Salt Lake in the west-central U.S.A. A text in yellow letters over the image states: “I Am Sorry For the Pain We Have Caused One Another The Memories Are Now Mine Alone”. 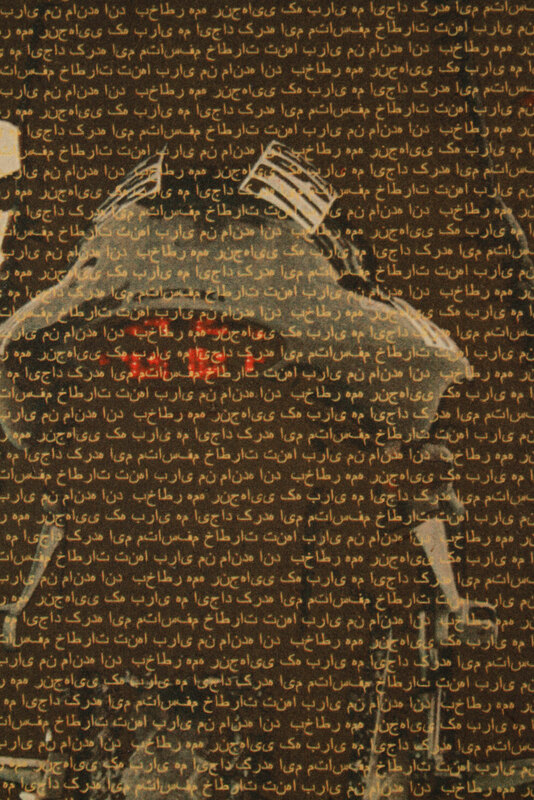 On the wall opposite, appearing as the second half of a diptych is “Slammed Farsi” where the repeated text appears in Persian. Felt is a material not only widely used in the global textile industry but also utilized in the daily life of Turkey. The choice of material in Bishop and Criswell’s works date back to 25 years ago when the artists lived in Turkey and Criswell decided to incorporate hand-made felt in her sculpture. During the 1985–86 year, while the couple was teaching at Hacettepe University, they participated in an international conference series and an exhibition that took place at 9 Eylul University and Hacettepe University. 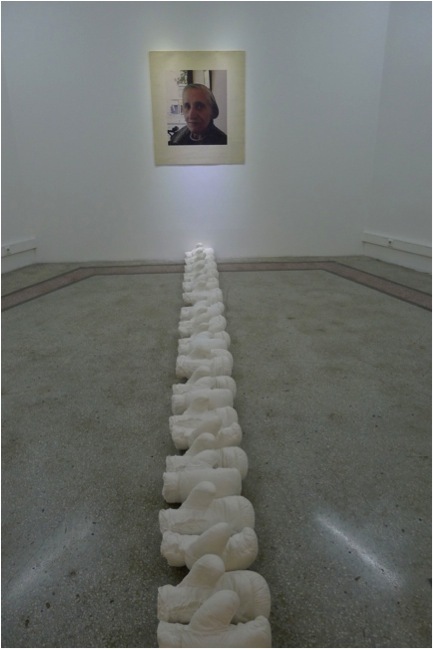 They also exhibited work incorporating felt at the Izmir exhibition, organized as a tribute to Joseph Beuys, who died that year. In the current exhibition, the mechanical images printed on this distinct surface also carry the image to a different time and geography. 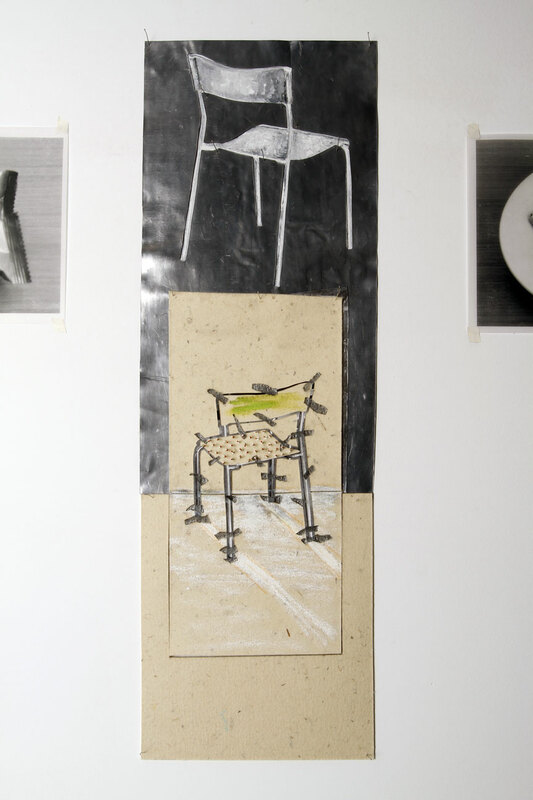 Instead of exposing his ideas directly, Bishop’s titles are oblique; he plays with the meaning and time of the image applied on a natural and traditional material. Although the photos were taken recently, the choice of print material causes confusion with regards to time. This way, the artist relocates these futuristic images and includes them in the past. 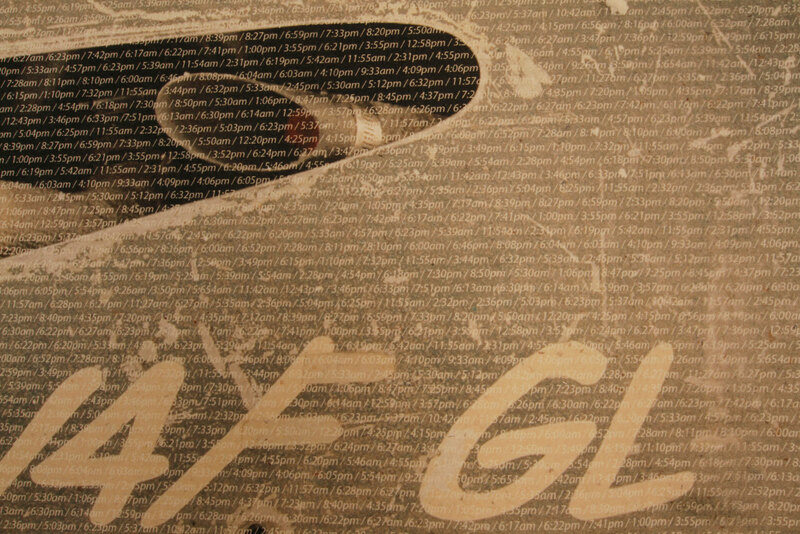 As Agamben phrases it, Bishop builds a “relationship with time that adheres to [one’s own time] through a disjunction and an anachronism.” This material and temporal ambiguity perceived by the viewer with some oblivion, evokes the feeling that one has encountered a scene from a cult movie of the 80’s such as Mad Max or Blade Runner, which at the time were futuristic in quality and now are nostalgic. Another characteristic of Bishop’s works is the use of text; inclusion of the text into the work both with its content, discourse and its calligraphic quality. 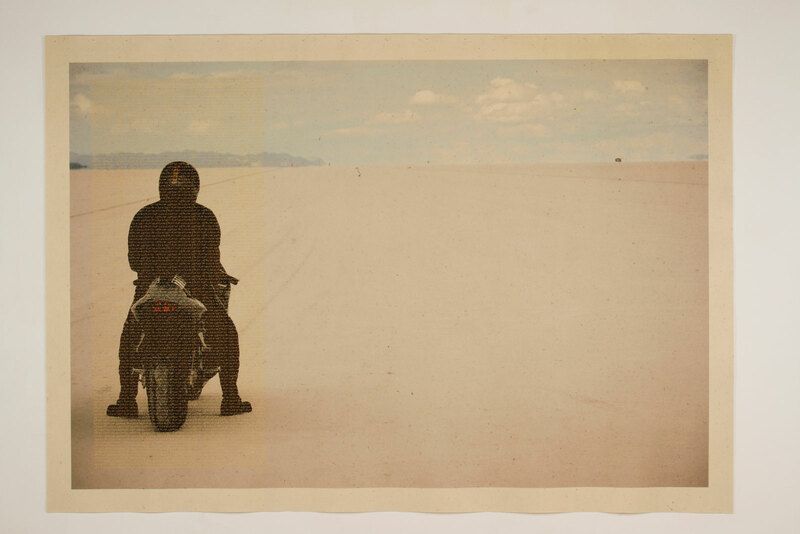 From a harbor in the Aegean Sea to an antique car on the Great Salt Lake, a visual consistency, which emphasizes Bishop’s ability to find and bring random things together, is established. 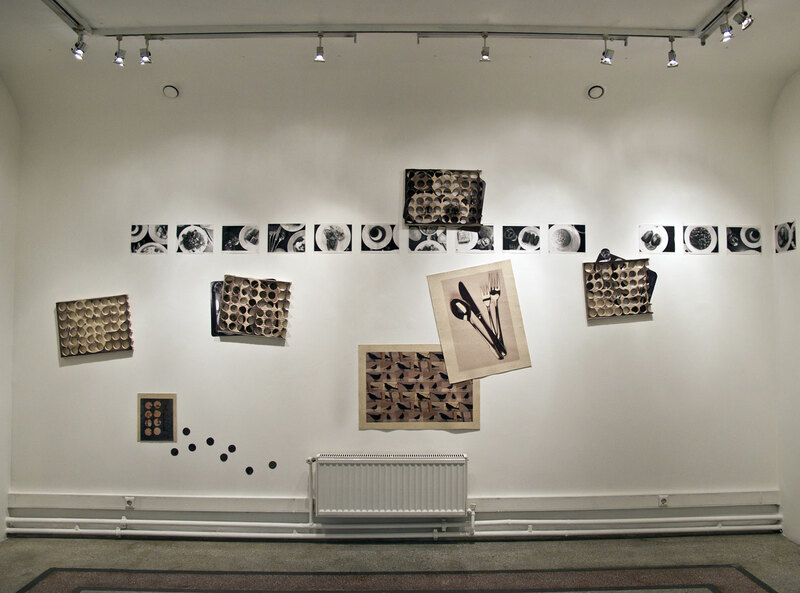 This visual consistency is then reflected in his use of text which initiates a dialogue between various geographies. The texts in Bishop’s photography also functions as a formal element of pictorial space, the foreground. When we enter the next section of the exhibition space holding Lynn Criswell’s body of work, questioning of the global and the approach that relocates images and their meanings outside of their time focuses on the personal. In this room, Criswell expresses the awkwardness and self-consciousness of being in another country, outside of one’s familiar setting. Through a photo chain, the artist documents the mechanized eating ritual at the Sabanci University campus where she has lived for 10 months. The feeling of estrangement experienced during each meal is communicated through a series of mass produced utensil images, showing them not only as they look but also changing them via personal interventions. Located in the center of the sprawling university campus, the dining hall is the focus of the works presented by Criswell in this exhibition. With its extensive scientific and social infrastructure, the campus resembles a satellite city, which can become claustrophobic and isolating after long periods of time spent there. It seems that for the artist, the feeling of estrangement makes itself most evident in the dining hall. The experience of eating becomes a test for Criswell where everything is multiple choice; hundreds of people sit and eat on mass produced chairs, around mass produced tables with mass produced utensils, whose clinking mix into the undecipherable conversations echoing under the tall dome of the dining hall. Photographs documenting this atmospheric struggle of consumption are taped to the exhibition walls. The images of empty tables, partnered blue and orange chairs, black and white photos of fruit and breakfast plates generate a certain rhythm in the exhibition space. These personal interventions of the artist introduced by her own movements and flow disrupt the rhythm created by the emphasis on mechanization and repetition in the photos. Elif Gül Tirben is a freelance writer living in Istanbul and an alumni of Sabancı University. Giorgio Agamben, What is an Apparatus? and Other Essays (Stanford: Stanford University Press, 2009), 41. Simon O’Sullivan, “The Aesthetics of Affect: Thinking Art Beyond Representation,” Angelaki: Journal of the Theoretical Humanities 6 (december 2001): 128. Ahmet Hamdi Tanpınar, Bütün Şiirleri (İstanbul: Dergâh, 1976), 19. Tanpınar, A. H. Bütün Şiirleri. İstanbul: Dergah, 1976. Agamben G. What is an Apparatus? and Other Essays. Stanford: Stanford University Press, 2009. O’Sullivan S. “The Aesthetics of Affect: Thinking Art Beyond Representation.” Angelaki: Journal of the Theoretical Humanities 6 (december 2001): 125–136. Posted in content, on artists and tagged Elif Gül Tirben, Kasa Gallery, Lynn Criswell, Michael Bishop, Sabanci University. Bookmark the permalink.